Asset Alliance scooped two major prizes at the industry-renowned Commercial Motor Awards 2017, being named Finance Provider Of The Year and Rental, Leasing & Contract Hire Provider Of The Year. Judges heaped praise on the business, saying the contract hire, finance and fleet management specialists “demonstrated real growth, market engagement and customer service”. The Wolverhampton company – founded by CEO Willie Paterson in 2010 – was also singled out for its “open, honest and proactive” business methods. Paterson says: “We couldn’t be more thrilled. The shortlists were of such a high standard this year, we were honoured to be among the finalists – so to be chosen as the very best in the business in two separate categories is really special. Asset Alliance beat some long-established competition to triumph in the first ever Rental, Leasing & Contract Hire Provider Of The Year category, with the company standing out from its peers for its consistency in meeting customers’ requirements as they grow in complexity and scope. While most businesses procure new trucks and trailers based upon historical buying patterns, Asset Alliance is working hard to ensure both funding and application needs are carefully considered when a business is looking to acquire new or used vehicles to ensure maximum value. 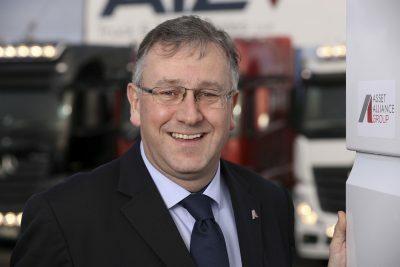 Such dedicated customer service is paying off – the rental, leasing and contract hire divisions of the Asset Alliance Group reported a total turnover of £15.5m for 2016, an increase of almost 48 per cent on 2015.